WHAT you teach kids matters. The CONTENT of the discipleship tools you create for parents matters. Why? 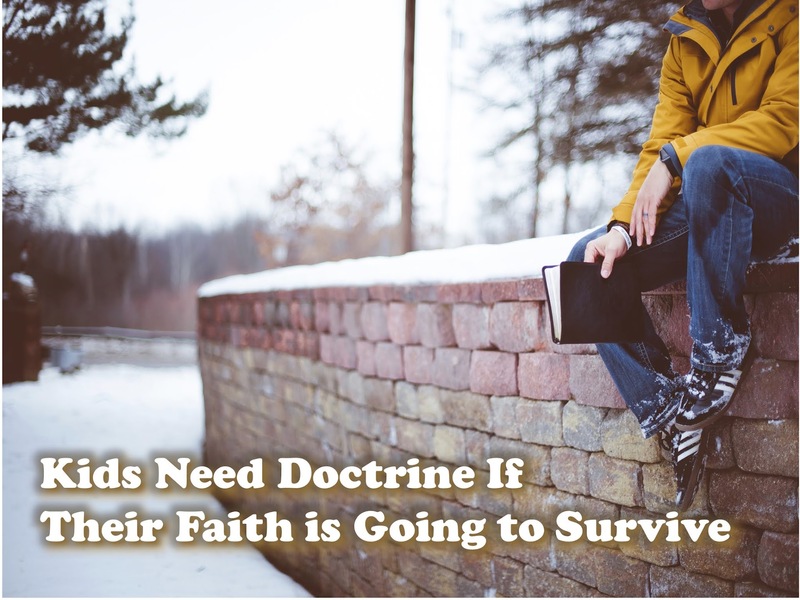 Because if kids do not understand the foundational doctrines of the faith, they will have a very difficult time defending the faith. Recent research has revealed that 13% of Gen Z claim to be atheists. This is over double the amount of adults who say they are atheists. More than ever, kids need to know why they believe what they believe. Their faith must be built on a solid foundation or it will crumble when they are challenged on a significant level. Here are 6 key doctrines that are foundational. As you look through these, I would encourage you to get the scope and sequence of the curriculum you are currently using and see if it is teaching these doctrines. The Bible is the Word of God - the Holy Spirit guided human authors so that what they wrote in Scripture is accurate and without error. God - God is a Spirit, a person, life, self-existent, unchanging, unlimited by time and space, and a unity….God consistently works out His eternal plan by guiding and overseeing all things by His wise and holy purpose. Christ - Jesus was in fact God incarnate in human form. He is the second person in the Trinity who came to live among us, die for us, and resurrect that someday we might be able to live with Him forever. Holy Spirit - the Holy Spirit is not merely a force, but has all the attributes of personality and is also God as the third person of the Trinity. The Holy Spirit’s work brings us to Christ and salvation, equips us for ministry, empowers us for service and produces spiritual fruit in our life. Salvation - The single most significant experience in life is receiving the salvation provided by Christ on the cross. When we invite Jesus to be our Forgiver, Leader and Friend, our sins are forgiven and we have eternal life. Church - Jesus gave us the church as a means of Christians assembling together to encourage and help one another in the Christian life and to enable them to be more effective in reaching out to others. The church exists for worship, instruction, fellowship and evangelism. If the curriculum you are using doesn't teach the kids these and other doctrines, then it's time to get a new curriculum. Some people hear the word "doctrine" and assume that means you have to teach the kids these doctrines in a boring, lecture-style lesson. Not at all, this is not about how you teach, but about what you teach. You can teach Bible doctrine to the kids in a fun, engaging and relevant way. In fact, if you teach the doctrines in a fun, engaging, hands on, learner-based way, kids will actually be able to remember them better. Others might suggest that you can wait until kids are in middle school or high school to teach them doctrine. But stats show us that the front lines for the next generation are now in elementary school. I believe we must start teaching doctrine in age-appropriate ways beginning as early as preschool. When we teach kids doctrine, I believe we must also take them on a deeper dive so they can defend their beliefs when they are challenged. And trust me, they will be challenged. We must equip them so they don't just survive these attacks, but thrive and win others to Christ. We must lead kids in asking the type of questions like you see below about the doctrines and help them discover the answers so they are prepared to give a defense of what they believe. Wasn't it just written by men? The Bible contains errors, doesn't it? How do you know God created everything? How do you know Jesus was the Son of God? Why do you believe Jesus is the only way to heaven? How can the Holy Spirit be everywhere at once? Why do you think the Holy Spirit is God? Why doesn't the Holy Spirit stop people from being hurt? Don't all religions lead to heaven? Won't I go to heaven if I do good things? All churches want is peoples' money. Questions like these are why we must teach kids Bible doctrine and equip them to defend their faith. The next generation is at stake. Every Sunday matters. Every lesson matters. Every person investing in the next generation matters. You matter. Your ministry matters. I have developed a strategic, one-year elementary curriculum that helps kids learn solid Bible doctrine. From salvation to spiritual leadership, they will discover 12 key truths that will give them a solid faith foundation. You can get more info. at this link. Man every one of your articles are top notch! I believe that "pattycake" teaching is deadly when children are well capable of grasping doctrine. I come here often for guidance. Your calling is on target relevant and truly mighty.